I'm a bit late in writing this post. I have actually tried a couple of times, but couldn't find the words to do it justice. I still can't, so I'll just rely on pictures! 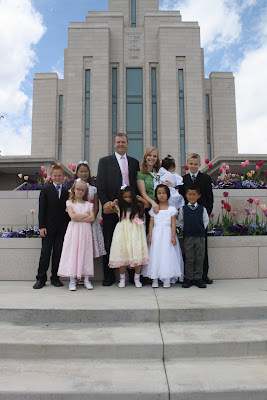 On May 28, we took our family to the Oquirrh Mountain Temple to have Lexi and Sophi sealed to us. For those of you who don't understand the significance of that, I will explain. 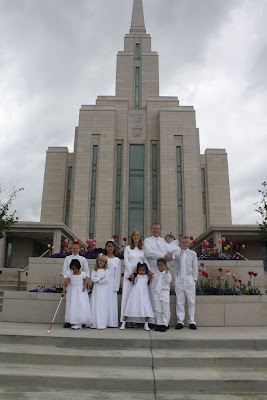 In our church, we believe that when we are married in one of God's temples, by proper priesthood authority, we are sealed to our spouses for all of eternity. We believe that family relationships perpetuate beyond the grave, and that children born to us under the sacred covenant of marriage are sealed to us forever. When we adopt a child, that child has not been "born in the covenant," so there is a special ordinance that takes place to seal them to our family. During this beautiful ordinance, the children kneel at an altar with their parents, all dressed in white. When completed, those children become as if they had been born to that family, with every blessing and privilege. There are no words to describe seeing your children, all dressed in white, in such a holy place and being reminded of what awaits us in the eternities. There is nothing like it to put daily struggles into perspective! We had some very special, sacred experiences while in the temple. I am so grateful for my knowledge of Christ and for what He has done for my family. Love you, our two newest girls!! Love all of the pics but especially love the one of Lexi smiling to the heavens. She might be able to SEE but she definitely knows God! Beautiful pictures! They truly show what life is all about! You guys are a great inspiration and example to everyone who is blessed to know you. Elli's blog doesn't seem to be allowing comments, so I'll say it here. Thank you for sharing that beautiful vision. That was a precious gift. As is Elli. beautiful pictures, and beautiful children! Congratulations guys - what a great concept of uniting the family in Faith! It's really good of you guys to share that little insight into your Church as well! It's so cool - while our Faith practices differ - it's clear that our core Beliefs are the same! 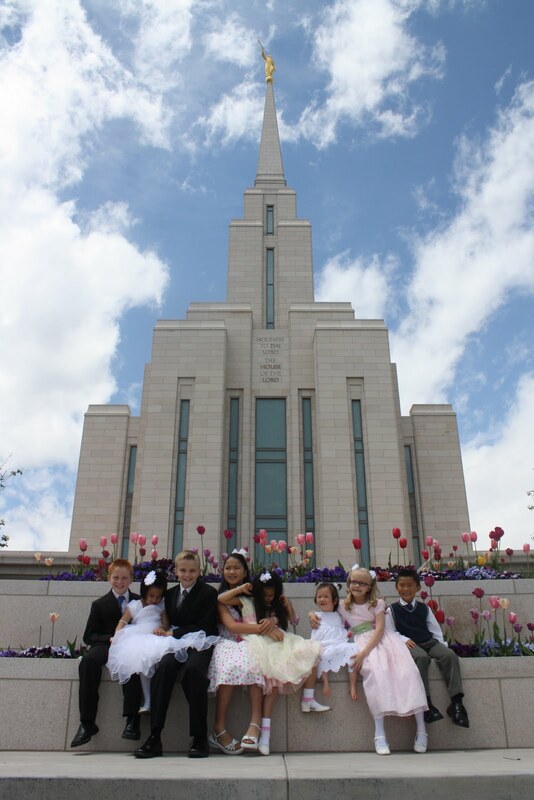 hugs - wonderful - great joy - and love - aus and co.
Can I ask why 3 different Temples? Absolutely beautiful pics of your beautiful family. What a Beautiful family you have. I love having Zander in my class, he is so fun!